Open now through until the end of July 2014 at LEA23 is Sniper Siemens’ brilliant installation Second Life History, a glorious walk through the platform’s past, marvellously presented in a series of visual vignettes which recapture events which are bound to be both familiar and new to Second Life residents. 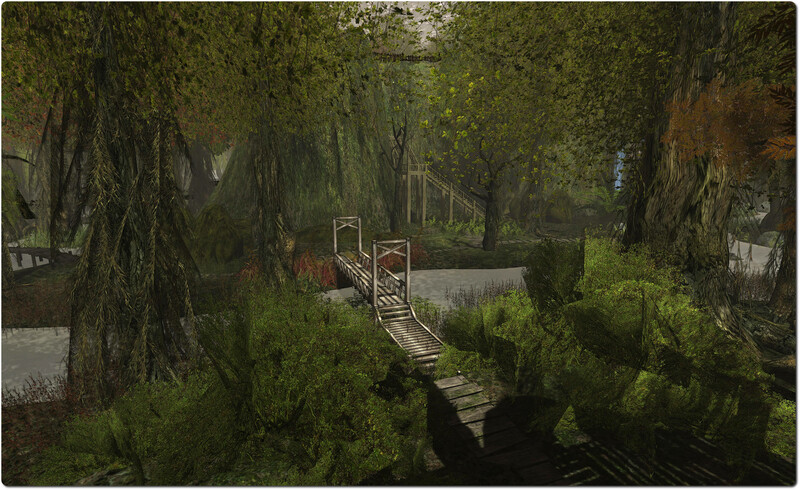 From the landing point, one is invited to tread a watery path through a partially submerged park, only the trees, lamp posts and railings visible, the route leading the way from the gates and 2001, through successive years charting the highs and lows of Second Life’s past and present, before climbing a set of stairs towards the open door of the future, and the promise of the Lab’s “next generation” platform. Along the way you can meet a Primitar (looking rather broken and forlorn, lying in the water) and various characters who point the way to different events and occurrences represented by information boards and self-contained scenes which evoke those moments of history and / or the emotions to which they gave rise. So it is you can learn about (or recall, if you’ve been around long enough) such events as the initial Second Life closed beta in 2002, the opening of the gates to all in 2003, the tax revolt later that year, the arrival of the Linden dollar as a virtual currency and the advent of free accounts, Black September (2006), the banking shutdown of 2007, the Lab’s withdrawal from paying VAT on behalf of users in the European Union, and so on. Technical innovations are also marked, both by overhead SL version numbers, and by their own little vignettes – LindenWorld, the first viewer, the arrival of the famous blue UI, prims, pay-to-TP teleport hubs, streaming media, open-sourcing the viewer, voice, windlight, viewer 2.0, it’s all here, as well as all the more recent technical innovations on the platform. 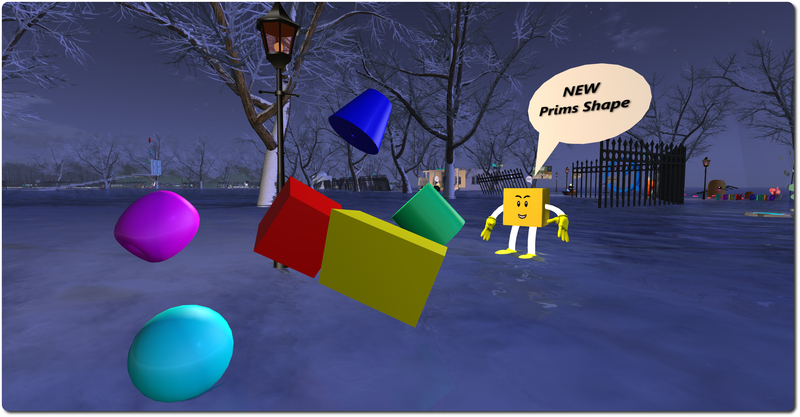 To call the installation a delight is an understatment; if you have any interest at all in SL’s history, it is guaranteed to stir memories, raise a smile, and more. 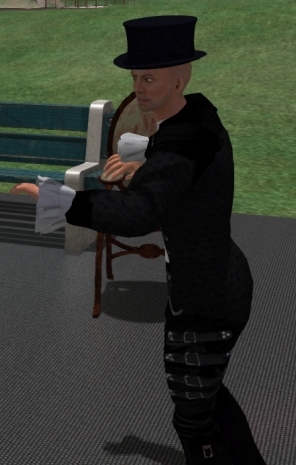 There are a lot of cheeky little touches, and one or two personal pieces; one little vignette marks the rezday of sniper’s first avatar incarnation, while further around the installation is a wonderful little poke at Philip Rosedale’s stepping-down as CEO. Similarly, the arrival of viewer 2.0 is announced by the appropriately named (given users’ reaction to the viewer’s arrival) Curveball Resident. While exploring the build, don’t miss the web icons; clicking these will take you the official blog posts on the subject being displayed / discussed. These include the very first official blog post from Philip Rosedale in 2004. This really is a marvellous installation, and shame on me for not having found the time to write about it any sooner. If you’ve not already dropped-in, I really do urge you to do so before the end of July; I seriously doubt you’ll be disappointed! Given the subject matter, it seems only appropriate that I close with yet another look back at LindenWorld from August 2001. Curious about art and the LEA? Why not pop along to their first Office Hours? The first Linden Endowment for the Arts (LEA) Office Hours will take place on Friday July 25th, between 10:30-11:30 SLT. LEA committee member Solo Mornington will be hosting the event, which will take place at the LEA Gateway. The meeting is open to all (subject to region limits! 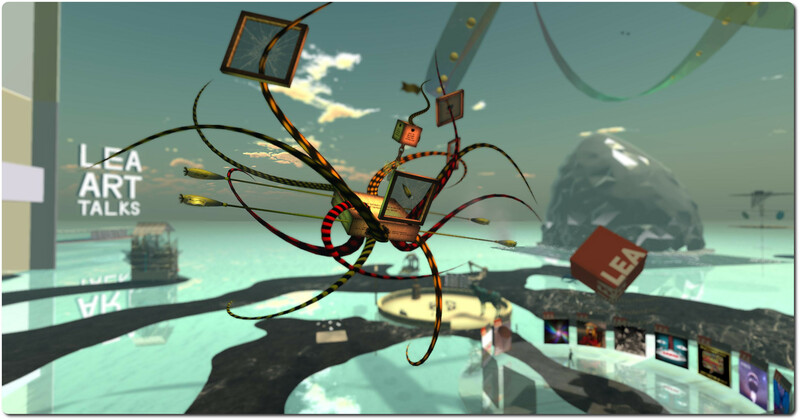 ), and those interested in art in SL, the work / purpose / structure of the LEA, etc., are invited to bring their questions. On Thursday July 24th, all three RC channel were updated with the infrastructure support for the upcoming changes to the Skill Gaming policy, and the updates previously deployed to LeTigre and BlueSteel – release notes. The Library Refresh viewer was updated to release candidate status with the release of version 3.7.13.292194 on July 23rd. This viewer contains an update to a large set of the libraries used by the viewer to provide security, stability and consistency improvements to this and future viewers. The anticipated group chat test didn’t materialise at the Server Beta meeting on Thursday July 24th as a result of Simon Linden coming across a last-minute issue which needed to be resolved ahead of further tests. He and Oz did, however, explain some recent discoveries within the chat system. The growth curve of these updates is described as exponential, and there is a knock-on effect with them as well; as group chat sessions share server resources, it is possible that a large group chat session, with multiple users joining / leaving it and thus causing it to generate lots of updates can affect other group chat sessions hosted on the same group chat server, slowing them down as well. While the chat servers are due for a hardware change, which is hoped will improve performance to a degree, simply adding more hardware to the chat service back-end isn’t seen as a solution, as it’s the exponential manner in which the updates grow which needs to be reduced and controlled. The testing Simon had hoped to run during the Server Beta meeting was to test some improvements he had been making to the queuing of the updates and in combining messages to hopefully reduced the load. However, in running over the code, he encountered a glitch that he needs to resolve before the testing can proceed.